Some of my earliest published writing were reviews of small press comics, for Independent Propaganda and then the Pulse. During that time, I also submitted work to a fledgling, and now-defunct, site: graphicnovelreview(dot)com. The main stipulation for their reviews were that they not go over 500 words. 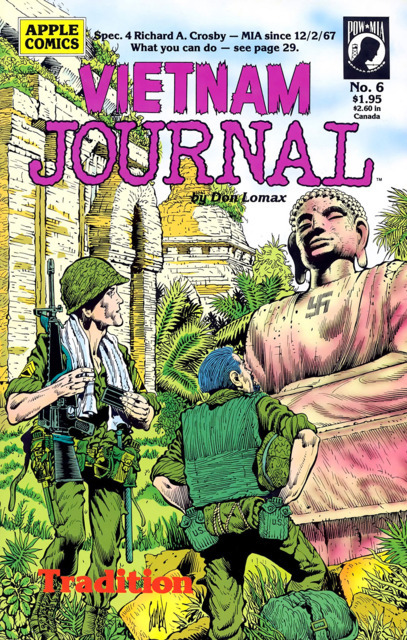 It was a fun challenge, trying to get everything I wanted to say on the page while being economical with my words, and I was happy with the submission I crafted for Don Lomax's Vietnam Journal. I never did hear back from them. No big deal. But, I did come across that piece in an old file folder a few days back and thought I would share--not just because I, generally, like what I wrote, but because Vietnam Journal is a great comic (#7 in my personal Top Ten all time comics--storylines edition). Hope you enjoy. And if you're looking for a great war comic, seek this book out, it's collected and available through Amazon. created by Don Lomax, published by Transfuzion publishing. Written and illustrated by Don Lomax, Vietnam Journal is a brutally honest look at what it was like incountry during the Vietnam conflict. Wishing to “ . . . counter the sophomoric, one-man-war approach to Vietnam” typified by the Rambo movies, Lomax opts in favor of diverse characters dealing with the horror of their reality. In a genre that falls so easily into cliché – John Wayne, Sgt. Rock, et al. – Lomax sidesteps these deftly while telling stories focused on serious, and sometimes unsettling, issues. The first chapter, “The Field Jacket,” exemplifies this when Scott “Journal” Neithammer, a freelance news correspondent, relates the story of the tattered field jacket he wears to his new comrades. He shares how one wearer avoided fatal injury from a homemade explosive while another’s mission was unexpectedly aborted. In every instance, the owner believed his good fortune was a result of the jacket’s protective qualities. When each of these soldiers left Vietnam – either due to a serious, or fatal, injury – the field jacket passed to another grunt until ultimately being laid at Journal’s feet. With its supernatural pedigree, Journal sees it in the same light as its previous owners, a good luck charm. In the end, however, the soldiers in Journal’s new company point out that the only luck that can be ascribed to the jacket is bad, since most who wore it became “believers.” These soldiers, despite having just crossed from the threshold of boyhood, realize that bravado and superstition won’t help them survive. Lomax’s art is not as polished as you might find in more mainstream comics, but there is a fluidity to his work reminiscent of Will Eisner or Stephen Bissette. 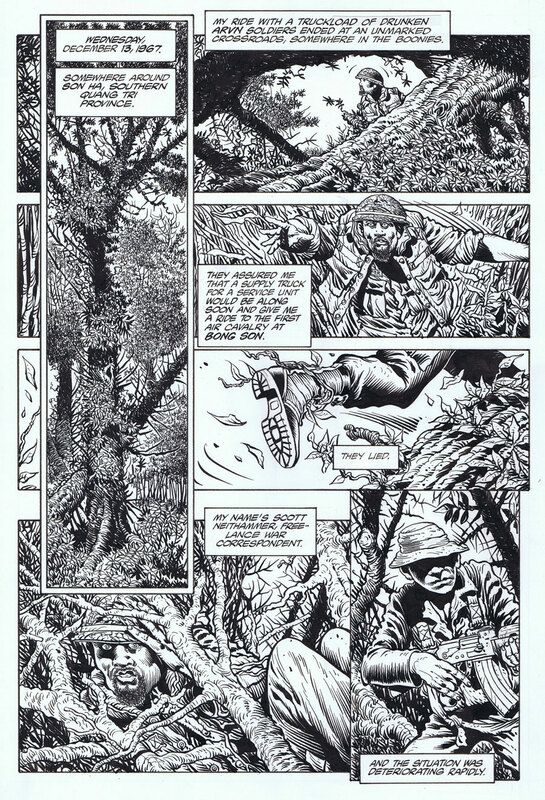 What Lomax’s art lacks in “beauty” is more than offset by his skilled use of the comic page’s unique strengths. His backgrounds are fully realized, evoking the splendor and harshness of Vietnam, while splash pages are used sparingly, adding to their impact and allowing them to resonate long after one closes the book. Lomax is also one of a handful of creators able to use captions successfully. Rather than reiterating what can be found in the pictures, he utilizes them to add to the narrative. 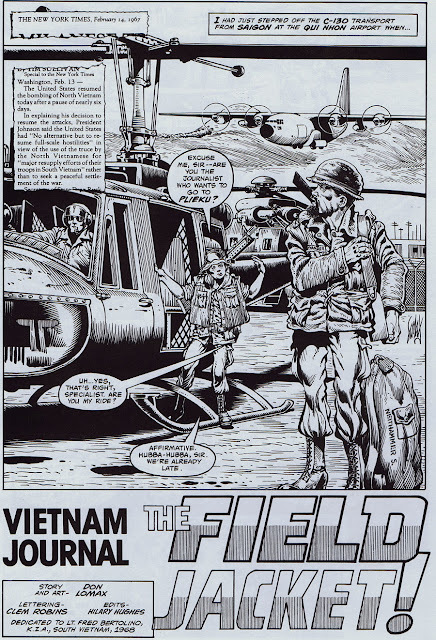 Lomax allows the images and words to mesh together in service to the story, elevating Vietnam Journal above the vast majority of graphic novels found on the shelves. Like any good work of fiction, Vietnam Journal also educates its readers. Not only does it inform its audience of those turbulent times – through the “Back in the World” feature, which includes excerpts from newspaper stories of the day – but the book also teaches readers about life. With events continuing to spiral out of control in the Middle East, these stories are more relevant today than when initially produced twenty years ago. Mr. Lomax presents an unfiltered view of what war is really like based on his own tour of duty in Vietnam. These are important stories that should be shared so their lessons can be passed on to a new generation.